The prisoner stood up. They had stripped off his tailcoat, but his white bow tie still hung lose around his neck: one half of it now soaked a deep red. The last few years have taken their toll on Conrad de Lancey: the International Brigade, Spain, the death of his comrades and back in England the break-up of his marriage. He tried getting back to his history thesis at Oxford, then a year's teaching in Suffolk. But now he has had enough of retreat. It's time to engage with the world and time to write that planned novel. This is why he is here, in a Berlin nightclub, looking forward to an evening of fun with cousin Joachim, a German diplomat on leave from Moscow. As the pair drink bad champagne together Joachim mentions an old friend of Conrad's, now an officer in the German army. Does Conrad trust him? Is he a Nazi? You see, they met recently but Joachim's indiscreet questions about some political gossip seems to have offended him. However Joachim would really like to talk to him about something. Would Conrad ask him to meet Joachim? Mystified, Conrad agrees and the cousins settle down to enjoy their evening. Then two Gestapo officers approach their table and instruct the cousins to accompany them back to headquarters. Conrad is outraged. But his anger and his British passport fail to impress. So he starts a fight, hoping that Joachim will escape during the confusion. Stunned by a pistol blow, Conrad manages to make it out onto the street but a close shot forces him to stop. He raises his hands in surrender. At Gestapo headquarters Conrad tries to explain that his excellent German is due to his half-German nationality, but the accusations that he is a spy continue alongside the insistence that he knows something about a plot against Hitler. Led into a cold cell and locked in, Conrad becomes increasingly frightened. During the night the door is flung open and a uniformed figure appears. With relief Conrad recognises his friend, Lieutenant Theo von Hertenberg, but Theo shouts at him and brusquely marches him to a waiting car. Away from Gestapo headquarters Theo relaxes and Conrad asks him if the Gestapo have Joachim. Theo tells him that Joachim has died of a heart attack in custody. Although shocked and disbelieving, Conrad understands when Theo explains that as he has had to vouch for Conrad he must ask him, for Theo's own sake, to forget everything that has happened. Conrad agrees but he cannot get his cousin's death out of his mind. TRAITOR'S GATE is a labour of love revisited for its author Michael Ridpath who started to write it in 2005. Several redrafts later and after the success of his Icelandic “Fire & Ice” crime series, Head of Zeus have decided that the time is ripe for a Ridpath spy novel. 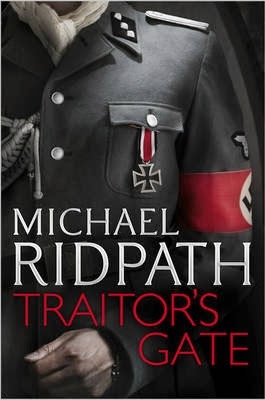 Ridpath studied twentieth century history at Oxford and has based his story on a real event which took place in 1938 – a plot by part of the German establishment to remove Hitler from power. He creates a group of characters true to their class and period and sets them amongst the nightclubs and cafés of Berlin in the increasingly dark days of an increasingly dark dictatorship. This is a Europe still reeling from the effects of the Great War and the central character – a young, educated and well-connected Englishman, Conrad de Lancey – tries to navigate the polarised politics and his own feelings as he revisits old friendships and enmities and eventually falls in love. Soon he has to decide where his loyalties lie. The pace heats up towards the end of the book as Chamberlain's real-life efforts at appeasement drives the suspense even harder. TRAITOR'S GATE proves Michael Ridpath's ability to write in a different voice about a different time. The tone of this book is worlds apart from that of the “Fire & Ice” series and hard-drinking detective Magnus Jonson of the Reykjavik police. Conrad's voice, as Ridpath himself puts it, has “a 1930s-style stiff upper lip”. Drop expectations of a fast-moving modern crime thriller, prepare to immerse yourself in another time and place – and you will be rewarded with a spy story containing a slice of history from the eleventh hour.